At first Hale’s publishing office served as the Lend A Hand office, becoming a clearinghouse for letters from individuals responding to Hale’s writing. By 1891 the volume of correspondence and publishing work had grown so large that the Ten Times One Corporation was formed as a central headquarters for the individual clubs. It was incorporated in 1892, and then, changed its name to the Lend A Hand Society in 1898. Hale became minister of the South Congregational Church, Unitarian, in Boston in 1856, as well as serving as the first president holding both positions until his death in 1909. Although Hale was a Unitarian minister, the Society was nonsectarian. Hale actively promoted and encouraged the establishment of Lend a Hand clubs which at one time numbered as many as 800. The day-to-day work of the Society was in collaboration with other relief agencies, providing aid to meet a need that might otherwise go unmet. 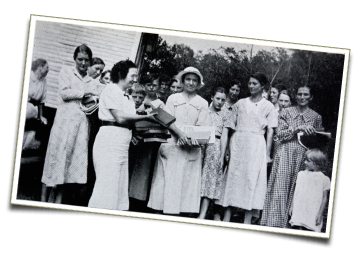 Wheelchairs and hospital equipment were loaned to those in need, layettes were given to new mothers, and “gentlewomen” were enabled to earn some money by sewing garments to be distributed primarily to hospitals and the Red Cross. The work undertaken by Lend A Hand varied in scope from operating the Noon-Day Rest, a lunchroom for Boston’s working women from 1893-1899, to what later became one of the central aspects of our work, sending books to schools and libraries in the rural South. Beginning in the 1930’s and continuing into the 1970’s, small loans were made to college and graduate students to assist them in completing their education. Vacations and convalescent care were provided for men, women, and children who needed to get away from their daily cares. In the 1970’s and early 1980’s, this goal continued to be met by sending children to summer camps. Sarah Brigham founded the Book Mission in 1890. Shortly after, it became a part of the Lend A Hand Society. After Ms. Brigham’s death in 1911, her niece, Anna E. Wood, took over the work. Both Ms. Brigham and Ms. Wood traveled to the south to learn firsthand about the communities that requested aid. Their successors Annie F. Brown, Mary Coburn, and Helen Merritt continued this practice. Their program sent new and used books to schools (usually small and rural), libraries, YMCA’s, prisons, and occasionally to individuals. Books were sent and institutions were aided regardless of the race of their students – a bold practice at the time; books were occasionally sent outside the South. In later years, the Book Mission, sent money to purchase books, rather than sending books themselves. Institutions were often helped on a continuing basis. This work continues today. The Boston Floating Hospital was founded by the Reverend Rufus Tobey in 1894 to relieve the suffering of sick children in the hot city by providing them with fresh sea air and to treat the summer diseases of children. Tobey was aided in this work by Hale, and the Floating Hospital was a department of the Society from 1896 until 1901, when it became a separate entity. Beginning at the turn of the century and continuing for a great many years, the Society contributed to the medical missionary work of Dr. Wilfred Grenfell and the Grenfell Association in Labrador and Newfoundland. 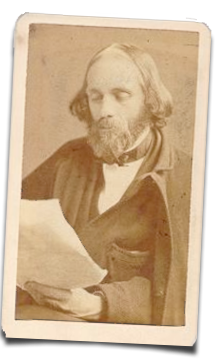 The Lend A Hand Society grew out of the response to a short story called “Ten Times One is Ten”, written in 1870 by Edward Everett Hale (1822-1909). The story tells of ten people who meet at the funeral of a mutual friend Harry Wadsworth and discover that he had financially helped each of them. They each resolve to follow the example of Wadsworth and to help their friends, neighbors and others in the community. They calculate that if each person they help would in turn lend someone else a hand (10 x 1 = 10, 10 x 10 = 100, etc. ), the powerful spirit of charity and giving would spread and grow.